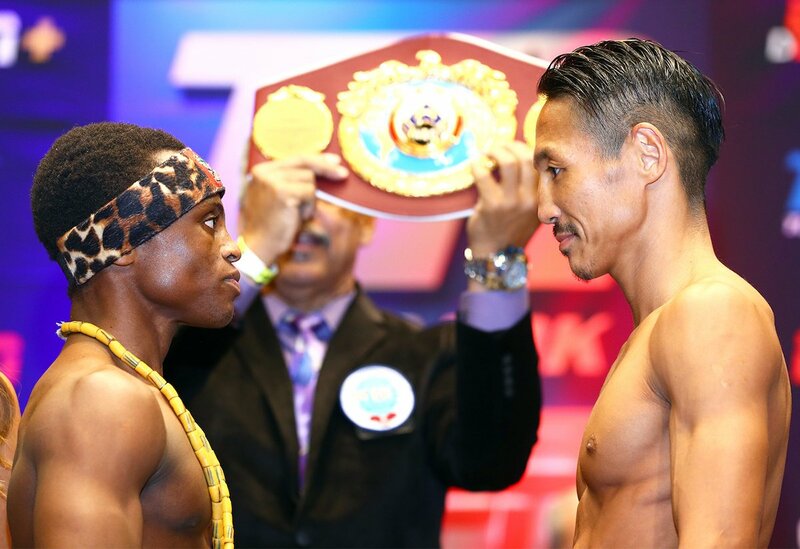 The countdown is over and everything will be decided in the ring at the Gila River Arena in Glendale, Arizona later Saturday night when Isaac ‘Royal Storm’ Dogboe of Ghana attempts a first defence of the WBO junior featherweight title against Japanese veteran, Hidenori Otake after both boxers made the required weight ahead of fight night. Dogboe (19-0, 13 KOs) who so impressively annexed the title via a round 11 TKO of previously undefeated American, Jessie Magdaleno back in April, tilted the scales at 121 lbs during Friday’s mandatory weigh-in at the Renaissance Glendale Hotel and Spa whilst Otake came in slightly heavier at 121.4 lbs. “Otake is very strong, physically strong. He has a great record. You can’t underestimate Otake. We’re not underestimating him at all. He’s someone we have our eyes on, and we’re making sure we are going to take him out,” Dogboe has said. “Otake is a gentleman. He’s so humble, and when two humble warriors come together, it’s mutual respect. And that’s how we’re taking it,” the young Ghanaian added on the lack of trash talk as compared to before his last fight against Jessie Magdaleno. The 37 year old Otake is equally mutual in his respect for the 23 year old from Accra but is confident he will return to Japan a world champion. “He is a good pressure fighter and a strong fighter. I’m going to use his pressure and his power against him,” he said of Dogboe. “Japanese boxers have been fighting very well recently, and I am looking to do the same. It’s great for Japanese boxing when we come to America and do very well,” Otake added. In the co-main event of the Top Rank Promotions bill to be screened live on ESPN, Ray Beltran made 134.6 lbs to set up the first defence of his WBO lightweight belt against Jose Pedraza, the former world champion from Puerto Rico who tilted the scales at 134.4 lbs. Also on weight for their female super featherweight clash scheduled for 6 rounds were Mikaela Mayer (129.4 lbs) and her opponent, Edina Kiss who made 128.4 lbs.